Have you ever touched a Whale? 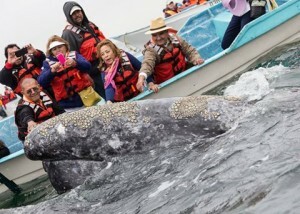 Be in a close encounter with the Grey Whales in their natural habitat with this Whale watching and whale touching tour. In this tour you can also see migratory birds, dolphins, desert, mountains, a great number of cactus, some endemic to Baja Peninsula and more. Join us for a narrated tour and learn more about Baja with us. It’s a unique experience! * Comfortable transportation and accommodations! * 2 Boat ride with a great box lunch included. * Visit the saltworks (salt procces area). * Admire the cave paintings in Cataviña. * Tour conductor and eco-guide. * Taxes, gratuities for hotel & restaurant services. Friday: 1st., 8th. & 22nd. *Visit to San Ignacio lagoon. * 2 more Whale watching encounter. * Visit the XVIII Jesuit Mission! * Additional accommodation with full breakfast and 2 boat ride with a great lunch, lagoon front! 8 people required. For smaller groups please contact us so we may include you in another group. We customize private services according to your needs for whale watching. Remember, small groups always get a better service! We also offer trips to the cave paintings of La Pintada, Las flechas and missions anywhere in Baja! We pick up in Tijuana, Rosarito and Ensenada! And now, special departures from San Felipe. 6 hour daily Whale Watching tour in Ensenada now available! Minimum of 3 people required. For smaller groups please contact us so we may include you in another group.